Caption on Moore emasculating her husband by M.M. Husbands, love your wives, as Christ loved the church and gave himself up for her, that he might sanctify her, having cleansed her by the washing of water with the word, so that he might present the church to himself in splendor, without spot or wrinkle or any such thing, that she might be holy and without blemish. In the same way husbands should love their wives as their own bodies. He who loves his wife loves himself. For no one ever hated his own flesh, but nourishes and cherishes it, just as Christ does the church, because we are members of his body. “Therefore a man shall leave his father and mother and hold fast to his wife, and the two shall become one flesh.” This mystery is profound, and I am saying that it refers to Christ and the church. However, let each one of you love his wife as himself, and let the wife see that she respects her husband. – Ephesians 5:22-33 (Emphasis Added). One thing is very clear to us: Beth Moore isn’t a Bible believing Christian. 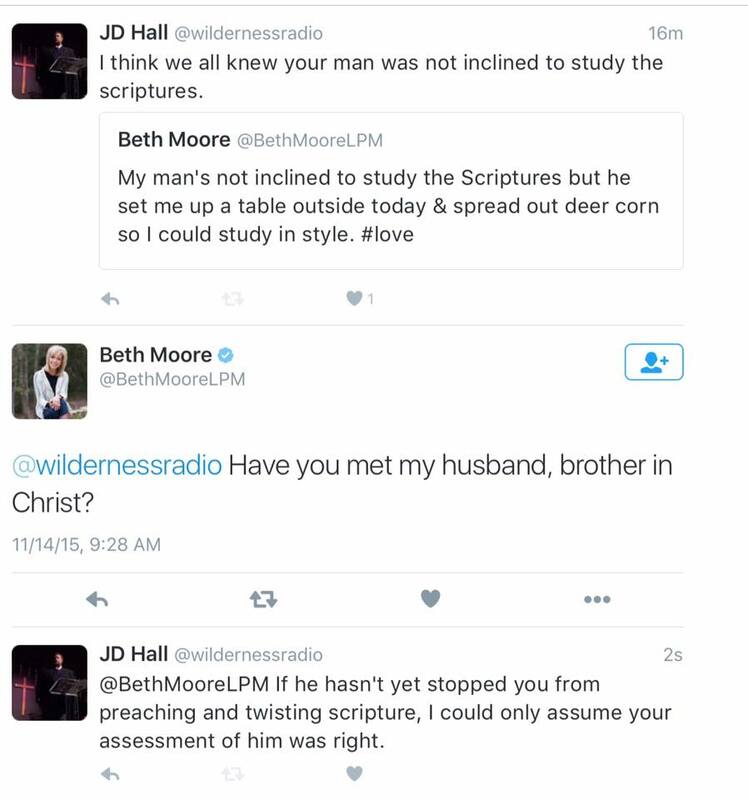 We thought the exchange between Jordan Hall (From Pulpit & Pen) and Beth Moore is worth ending on. ‹ Ed Stetzer pushing Chrislam? What’s been interesting is all the apostates’ comments on the internet supporting Beth Moore and poo poo’ing all the Discernment Websites’ articles about Beth Moore leading her family. Now we know, the Discernment Websites such as Churchwatch were SPOT ON all along, and the apostate denyers were, well, uh, apostates as usual. Nice job exposing the lie, Churchwatcher. Keep up the good research work! Hateful and somehow claiming the name of Jesus. Thanks for commenting E Bolz. Can you clarify your statement? If we are wrong about Beth Moore, please show us biblically.